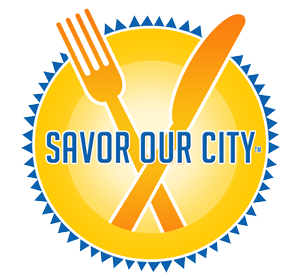 Savor Our City™ Culinary Tours debuted their inaugural tour, “Taste Atlantic Ave” on Saturday, May 3, 2014. ” We are delighted to introduce the launch of our unique walking historical food tours in Palm Beach County. Our tours cater to the Adventure Traveler who really wants to enjoy a city through its culinary senses. We journey behind the scenes and soak in the history of old Delray while satiating our guests’ curious appetites. Participants have the opportunity to meet food artisans who represent some of the best restaurants and gourmet shops in the city”, says Savor Our City founder Denise Righetti. Participants will have the opportunity to get a real taste of Delray Beach. The “Taste Atlantic Ave” tour will introduce foodies to some of the best restaurants and specialty gourmet shops on “Atlantic Avenue”, a charming streetscape filled with upscale shops, fine restaurants and nightly entertainment. What makes Savor Our City Culinary™ tours unique is that we have chosen neighborhoods/districts that are 100% walkable and we provide not only historical facts, but interject fun and interesting anecdotes and stories obtained through interviewing long time residents as well as the historian from the historical society. Led by founder Denise Righetti and her team of knowledgeable foodies & wine enthusiasts – many with hospitality, culinary and/or food blogging backgrounds – these gourmet adventures take both local foodies and visitors alike behind-the-scenes into each city’s hot culinary communities, where they will be introduced to delicious savory treasures and sweet gems one bite at a time. A typical tour will include sample cuisines from four restaurants and two gourmet specialty shops. An example of some of the foods sampled on this tour may include a gourmet burger and truffle fries from an American Gastropub,chicken souvlaki from a Greek Taverna,ultra premium extra virgin olive oils & balsamic vinegars from around the globe, an authentic Philly steak sandwich, Bahn Mi lettuce cups and finally, something to satisfy that sweet tooth. Included with the tour, each guest will receive a complimentary map and an insert highlighting every stop on the tour, with the names of each place, the address, their hours, what foods were sampled, with special offers. “Taste Atlantic Avenue” tours run every Saturday, 11am – 2pm and the third Friday of every month from 5pm for $65 per person. To book your tour, go to www.SavorOurCity.com or call our ticketing agent, Zerve at (800) 979-3370. We are running a special promotion for the remainder of the tours this month for $50 per person. (Must use promo code STCL1). Gift Certificates are available as are Private & Group Tours. Please contact Denise Righetti for more information or photos. (954) 410-3177.